Initiatives in Logistics | Environmental Initiatives | Corporate Social Responsibility (CSR) | Akebono Brake Industry Co., Ltd. 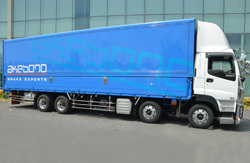 When transporting parts and products, Akebono undertakes various efforts to reduce CO2 emissions and decrease the impact of the distribution process on the environment, such as optimization of transportation and loading methods or changing means of transport to more environmentally friendly ones. 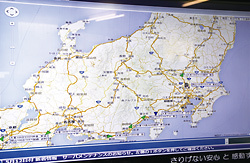 The Akebono Group member Alocs Corporation (a logistics solution company) is employing a truck operation dynamic management system. The system utilizes data on individual vehicles gleaned from onboard sensors, such as engine speed, driving speed, acceleration rate and location. This data is automatically transmitted to the headquarters. Associates in charge of truck operation management use the data to give timely instructions to each driver so that they can avoid crowded routes and helps to ensure that drivers are taking breaks as needed. In these ways, Akebono is ensuring safe and environment-friendly truck operations. In addition, the system also enables objective determination and ranking of drivers’ eco-driving by recording data about idling time and sudden acceleration and braking. Through measures such as these, the system can be used to increase motivation for eco-driving and safe driving. Akebono will continue working to save energy and rationalize its distribution operations, ensuring safety while protecting the environment. Through various efficiency improvement activities, Akebono is helping to improve associate productivity, and lower transportation costs by reducing energy resources. 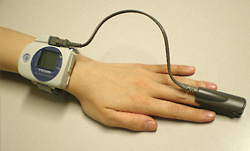 Traffic accidents caused by drivers' ill health, including sleep apnea syndrome (SAS), are becoming a social issue in Japan. Against this backdrop, Alocs Corporation conducts SAS screening for drivers, in addition to semiannual health check ups, to detect early signs of illness and ensure safe driving.